In 1834 French meteorologist Jean Peltier connected a copper wire to each end of a wire made from bismuth and then connected the free ends of the copper wires to the terminals of a battery. He discovered quite by chance that where the current flows from the first copper wire to the bismuth wire the junction got hot, and where the current flows from the bismuth wire into the second copper wire the junction got cold. The temperature of the cold junction falls by up to 20 degrees Celcius relative to the ambient air temperature. 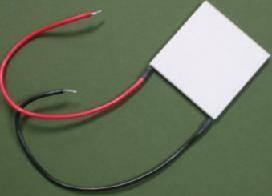 This thermoelectric effect is now known as the Peltier effect. While the copper and bismuth (or iron) wires have been replaced with semiconducting alloys enabling multiple junctions to be connected to give a greater cooling effect in today’s Peltier modules they continue to offer a very simple (though inefficient) method of cooling – for example in electric coolboxes, CPU cooling inside laptops, and many other applications. The typical Peltier module pictured above has no moving parts and when used within its specified parameters will last for many many years. When a DC voltage is connected to the two wires, one of the ceramic faces of the module will get hot and the other will cool down. If the polarity of the DC voltage is reversed, the hot face will become the cold face and the cold face will become the hot face. Click here to buy Peltier cooling modules with prices starting from just a couple of pounds/dollars. 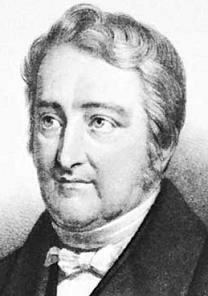 The inverse of the Peltier effect is the Seebeck Effect named after East Prussian scientist Johann Seebeck who actually discovered it 15 years before the discovery of the Peltier effect in 1821. He discovered that if a wire of one metal is connected at both ends to wires of a different metal, and if there is a temperature difference between the two junctions, electrical current flows. 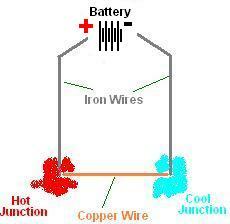 So, with the Peltier effect, use a DC voltage to change the temperature of the junctions. 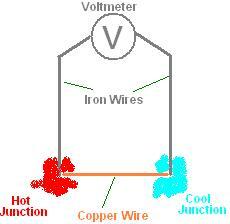 With the Seebeck effect, change the temperature of the junctions to get a DC voltage. 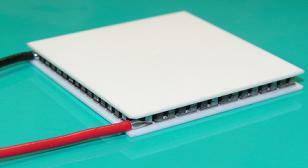 Therefore is it possible to generate electricity with a standard Peltier module? Yes, it is. If one face of the module is heated and/or the other face cooled, electric current will flow at a rate proportional to the temperature difference between the two faces of the Peltier module. 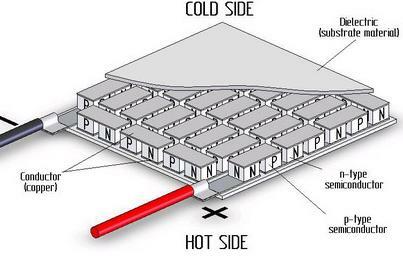 However, a standard Peltier module is designed to heat one face and cool the other face efficiently – primarily for cooling applications and so a) it does not generate electricity efficiently, and b) it cannot cope with very high temperatures (typically <120 degrees Celcius). Fortunately there are now thermoelectric modules available which are optimised to generate electricity efficiently when there is a temperature difference across the faces. These are called thermoelectric generators (TEGs) and are designed for high temperature applications (e.g. maximum of 230 degree Celcius) with teflon coated leads etc. These thermoelectric generator modules (such as the one pictured above) are usually quite a bit more expensive than similarly sized cooling modules, but prices are coming down and they are getting easier to find. We buy our TEG modules from Thermal Enterprises in the USA: buy High Temperature Power Generation Thermoelectric Modules.